Mockernut Hickory - Carya tomentosa is also called the Bullnut, Hognut, Mockernut, White Hickory or Whiteheart Hickory (Depending on the region it is located in). The Mockernut Hickory is a large deciduous tree that can reach heights of up to 100 feet in ideal conditions. It is native to the United States and can be found growing from Massachusetts and New York in the North, west to southern Michigan and Northern Illinois, south to eastern Texas and east to northern Florida. 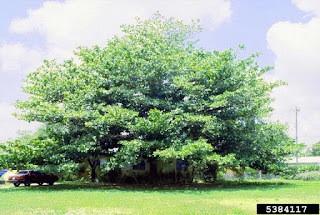 Mockernut Hickory is considered to be a tough tree and can take abuse, it's timber is used for tool handles. 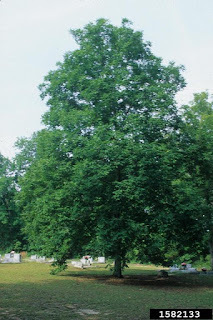 The main trunk of the Mockernut Hickory is free of branches before spreading into a thick oblong shaped crown. Tha bark is a mousy gray in color with very tight interlocking flat or slightly rounded ridges that appear to be almost laced together over the crevices. The bark pattern gives the trunk the illusion of being wrapped in tight netting. The leaves are alternate, compound and 8-12 inches long with 5-9 leaflets each that are a deep green in color. In the fall the leaves change to a bright yellow, yellow-brown and finally brown before falling to make room for next seasons new growth. The leaflet bottoms and leaf stalks are covered with fuzzy hairs and the edges are finely - coarsely toothed. When crushed the leaflets release a strong odor. The nuts have very small fruit cavities and are clothed in thick round or pear shaped husks with indented seams. The nuts are a favorite meal for squirrels. The Sugarberry - Celtis laevigata is a small deciduous tree that grows upwards of 95 feet, they often flower and fruit when young. The Sugarberry grows in an upright erect form with an open spreading crown. 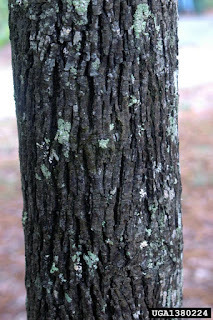 The simple bark is grey in color and smooth when young, becoming marred with cork or wart like ridges / growths. The bark marking is often caused by bird excavating the bark to access the sweet sap, this in turn attracts insects to the wounds. The leaves are simple and alternate usually thin and paper like in texture, lanceolate or ocassionally ovate with a rounded, flattened or asymmetric tip. The upper surface is pale green and hairless, smooth surfaced with visible veins. The Sugarberry is a member of the Cannabaeceae (Hemp) family. Sugarberry is usually found growing in sandy loam or rocky soils along streams, bottom lands, and in woodlands. The Cannabaceae Family is made up of 11 genera and 180 species of shrubs, trees, herbs and vines - 14 species are found in North America only 9 are native others are naturalized. The woody members of this family are most easily identified by their alternate simple leaves with 3 primary veins from the base and inconspicuous flowers, and were originally classified as members of the Elm family (Ulmaceae) but recent studies suggest they should actually be included with the Cannabaeceae family. Sugarberry has long been used for many purposes by a variety of Native American tribes. The Houma used a concentrate made from the bark to treat sore throats and ground up shells to treat venereal diseases. The Comanche would beat the fruits to a pulp and then mixed with animal fat, rolled into balls, and roasted in the fire as food. The Acoma, Navajo, and Tewa all consumed raw Sugarberries for food. The leaves and branches were boiled by the Navajo to make dark brown and red dye for wool. White Pines are a large growing evergreen with blue-green needles that are generally 2 1/2-5 inches long. The needles grow very densely on the branches. Pines are different from other conifers/evergreens, their needles grow in sheathed groups of 2,3 or 5. It is a tall tree with straight gray-brown trunk and horizontal growing branches. The cones are small and slender rarely growing longer then 3-6 inches. White Pines can live on average 200-250 years although there are a few recorded to be over 400 years old. Growing about 3 feet per year between the ages of 15-45, but at a slower rate in the juvenille and mature stages before and after that point-they can reach heights well over 150 feet tall, one record holder came in at 207 feet (The Boogerman Pine). The White Pine has a very wide growth range from the North Eastern United States through Southeastern Canada, this is the only five needled Pine that grows East of the Rocky Mountains. 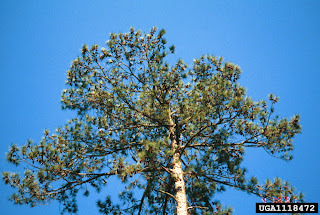 Another five needled Pine found in the United States is the Sugar Pine, this is only found in the West. Thought to have originally covered most of the Eastern United States, there are only 1% of the original old growth forests remaining. 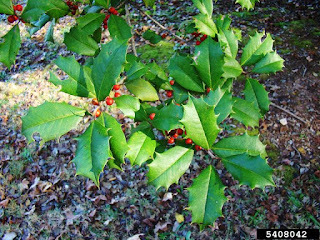 The American Holly - Ilex opaca, is an evergreen holly that is most easily recognized by it's uniquely shaped lustrous dark green leaves with spiny margins. American holly is a slow growing, long lived tree that can reach heights of around 60 feet tall, however they average only 45 feet in most regions. They grow in an mostly erect upright fashion, with a single main trunk and a pyramidal shaped crown when grown in open areas. Usually planted as a specimen tree, they require little pruning to keep their shape and naturally have a symmetrical growth habit. When found in forest and woodland settings the American Holly has more of cylindrical shape with less branches and less symmetry. The American Holly has smooth light gray bark that occasionally has wart like growths. The leaves are Alternate and simply shaped, either oblong or elliptic. The leaf apex is spine tipped, sharp enough to pierce your skin, the margins usually are rolled downward. The upper leaf surface is lustrous and dark green in color, the lower is duller but close to the same color. The "fruit" comes in the form of small lustrous 7-12 mm rounded red berries. These berries appear in the fall and grow in clusters at the base of the leaves. Only female Holly Trees bear fruit/berries, which occur in Autumn annually. Don't be confused however by the word fruit, the leaves and berries from Holly Trees are NOT EDIBLE to humans, and are known to cause severe stomach issues if ingested. The small white flowers of the Holly occur with male and female on separate trees. American Holly is native to moist woodlands, rich slopes, margins of floodplain forests from 0-1500 m. The American Holly can be found from New York and Massachusetts in the North all along the East coast South through Florida and West through South Easter Missouri and Eastern Texas. They are recommended for hardiness zones 5-9 and is considered both evergreen and ornamental. Holly trees offer beauty all year long as well as wildlife cover and food for birds. Over 1000 cultivars have been developed from the Holly. American Holly is the state tree of Delaware. The Carolina Hemlock - Tsuga caroliniana, is a member of the Pinaceae (Pine) family and of the genus Tsuga. It is Native to areas with nutrient poor soil and low risk of fire, most often found growing slong side mixed hardwoods-conifer stands and Rhododendron understory from 600-1500 m. Carolina Hemlock can be found growing from southwestern Virginia, eastern Tennesee, western North Carolina South Carolina and northwestern Georgia. 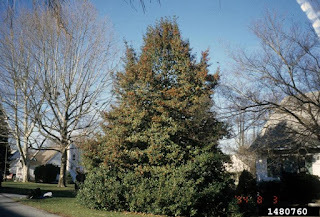 The Carolina Hemlock is an attractive tree but does not have a high commercial value and is rarely grown ornamentally. Reaching heights of 60 feet tall it is very similar in appearance to the Eastern Hemlock. The cone of the Carolina Hemlock is ovoid to oblong, 2.5-4 cm long and 1.5-2.5 cm broad. The cone scales spread widely as the cone dries out. The twigs are light brown, smooth and thinly covered with short dark hairs. The leaves are in the form of 10-20 mm long flat and slightly downcurled needles that spread in all directions from the twig. The custom of the Christmas tree developed in early modern Germany with predecessors that can be traced to the 16th and possibly even the late 15th century. Customs of erecting decorated trees in wintertime can be traced to Christmas celebrations in Renaissance-era guilds in Northern Germany and Livonia. Fir trees have been traditionally used to celebrate winter festivals by both Pagan's and Christian's for thousands of years. Pagans used Fir branches to decorate their homes during the winter solstice, as it reminded them to think ahead to Spring. The Romans used Fir Trees to decorate their temples at the festival of Saturnalia. Christians use it as a sign of everlasting life with God. A Christmas tree is a decorated tree, usually an evergreen conifer such as pine or fir, traditionally associated with the celebration of Christmas. Each year, 33 to 36 million Christmas trees are produced in America, and 50 to 60 million are produced in Europe. In 1998, there were about 15,000 growers in America (a third of them are "choose and cut" farms, which allow buyers to select their tree before cutting it down). In that same year, it was estimated that Americans spent $1.5 billion on Christmas trees. Some trees referred to as living Christmas trees, are sold live with roots and soil, often from a nursery, to be stored in planters or planted later outdoors and enjoyed (and often decorated) for years or decades to come. In the past, Christmas trees were often harvested from wild forests, but now almost all are commercially grown on tree farms. Almost all Christmas trees in the United States are grown on Christmas tree farms where they are cut after about ten years of growth and then new trees are planted to begin the cycle again. Christmas trees are a large attraction for small mammals, birds and spiders as they provide nesting and shelter. The Christmas Fern - Polystichum acrostichoides - is often associated with the Christmas season and is of the most common ferns found in the Eastern United States. Though it is not written in stone how it got it's name, some of the guesses are: the leaflets are described to be shaped like a sleigh or stocking, it is one of the few woodland plants still green during the month of December/Christmas season, and it is often used in holiday decorating as greenery or in wreath construction. It is found growing in a wide variety of locations and habitats, from shaded hillsides, to rocky cliffs, to wooded stream beds. The native range is generally the Eastern portions of North America from Nova Scotia in the North, West through Minnesota, all the way down South from Texas in the West to Florida in the East. Generally when found in the wild this fern grows in a fountain like clump that is made up of various size fronds. The clumps often grow in large colonial masses and may provide complete groundcover and even erosion protection. The Christmas Fern resembles the Pacific Coast Sword Fern. The Christmas Fern, is also popular as an ornamental plant for gardens and natural landscaping, because it is easy to grow and can be used in many settings and soils, even shaded areas under large trees where other plants may not survive/thrive. They are quite hardy, require little care, adapt to most growing conditions, and are also resistant to pests and diseases. If you are looking for a very low maintenance plant that will add some green in your garden over the winter, then the Christmas Fern is definitely a good choice. When young the crosiers (fronds) are curled and a silvery green in color before opening to reveal the mature fronds as the season progresses. When the fronds first open they will still have a slightly curled appearance which will straighten with time. Once completely open the evergreen fronds average 12- 32 inches long and are made up multiple green leaflets growing in a odd/alternate pinnate shape. The number of leaflets on each frond greatly varies by the length of the induvidual frond. The Eastern Redcedar - Juniperus virginiana is a medium sized columnar tree, reaching heights of 40-60 feet tall when mature. It is not a true Cedar but is a member of the Juniper Juniperus family . The crown is thick and conical in shape and is filled with blue-green prickly, scale-like foliage. Young trees have small, sharply upturned branches that help to form the conical shape of the crown. When very old the tree will begin to have an irregular shaped crown. Large specimens often become fluted at the base. The slender twigs are covered with aromatic green, scale -like leaves, running opposite in four rows. The fruits are soft and dark blue berries with a white bloom, they contain one or two seeds. They grow naturally in uplands and fence/hedgerows in most of the Eastern United States. They are also commonly planted in more formal landscapes as an ornamentals. Eastern Red Cedar lumber has been used traditionally for aromatic lumber products such as Cedar "Hope" Chests and closet lining. The oils of the Eastern Redcedar are also extracted and used in many applications. The heartwood from the Eastern Redcedar is pink and considered to be somewhat brittle but very rot resistant. Many species of bird feed on the berries, the birds digestive system break down the fruits hard coating and when eliminated by the bird the seeds are able to germinate and grow new seeds. Eastern Redcedar can be found growing throughout the eastern United States. 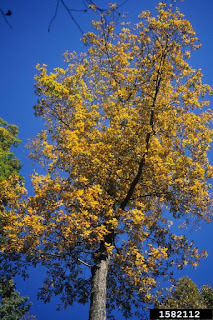 The Winged Elm - Ulmus alata, is a small to medium sized deciduous tree that reaches heights of less then 50 feet tall and usually not more than 1.5 feet in diameter. The Winged Elm has a generally wide, rounded crown that is made up of long slender branches many of which are winged with wide, cork like ridges on either side making the tree easier to identify. It is sometimes also referred to as the Cork Elm or Wahoo. Winged Elm is common in the Southern portion of the United States and can be found easily from Virginia south through Florida and West through Texas. The bark of the Winged Elm is thin, irregularly shaped, with rough flat plates, shallow fissures and light gray in color. When shaved or peeled back the bark will reveal thin bands f dark and off white thin inner layers. The leaves are 1.5-3 inches long and 1-1.5 inches broad, with evenly spaced coarse teeth that are divided by smaller thinner teeth in between. One side of each leaf is wider then the other, with the thin yellow vein appearing off center on each leaf. The leaves are a bright green in color and can be either smooth or rough on the upper surface, while the lower surface is always smooth. In the fall the leaves turn a lovely bright yellow and sometimes a coppery brown. The Winged Elm is a small tree and can be used in both commercial and residential settings. Since it is a realtively small tree it does not have value as far as lumber production is concerned. It is also not a desired firewood as the grain of the tree is interlocking and very difficult to split by hand. The Winged Elm has not been recorded to be affected by Dutch Elm disease, a disease that has been deadly to most Elm varieties. Recommended for hardiness zones 6a-9b. 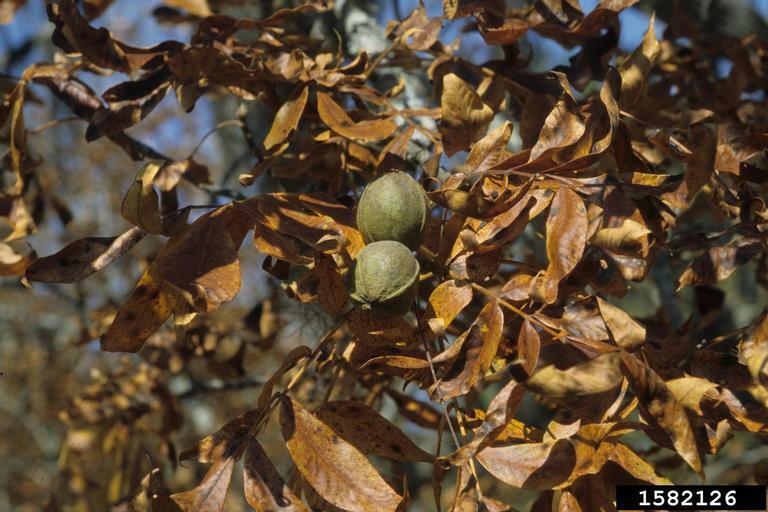 The Pignut Hickory - Carya glabra is most easily identified by the combination of 5-7 hairless leaflets and snout like extension at thr fruits base. It is a deciduous tree with a rather large Native growth range that spans across the entire East Coast (excluding only Maine) from New Hampshire in the North to Florida in the South continuing West through Eastern Texas, Eastern Kansas, Eastern Oklahoma, Illinois and Michigan. It prefers well drained moist uplands, floodplain margins, slopes, and dry rocky soils and is found between 0-800m. At maturity it can reach heights of between 80-130 feet tall, growing in a generally upright fashion it tends to have a broad crown when surroundings allow (in woods settings it is more narrow at the crown). The bark of the Pignut Hickory is gray and tight to moderately furrowed. The leaves are alternate pinnately compounded with an evident terminal leaflet. Each leaf is made up of leaflets usually occurring in numbers of 5-7 or very rarely 3 with sharply toothed margins. The upper leaf surface is a dark green while the lower is a paler green with small tufts of hair in the major vein axils. In the fall the leaves change to a rusty yellow color before falling. The male flowers occur in catkins that are 5-7 cm long and 5 mm in diameter. The fruit is an ellipsoid or rounded husk covered nut that ranges in size from 2.5-6cm long. The husk of the fruit is very thin usually only 2-5mm thick, splitting in an irregular fashion. The shell of the nut is tan with a sweet kernel that matures in the Fall. The hickory tree's strong yet flexible wood and excellence as fuel made it invaluable to pioneers, the Pignut Hickory is no exception to this. It is a large slow growing deciduous tree that can stand on it's own a the centerpiece of a landscape design. 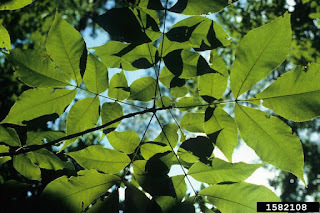 The pignut hickory offers lightly hung foliage in the Summer months that casts a medium shade to the ground below. The yellow leaf coloring in the Fall and the open crown habit and bark in the Winter are some of the most notable points of visual interest. The hickory is particularly beautiful when winter buds open in late spring; the bud scales fold back, petal-like, as new foliage emerges. Pignut hickory's nutritious nuts attract various type of wildlife. 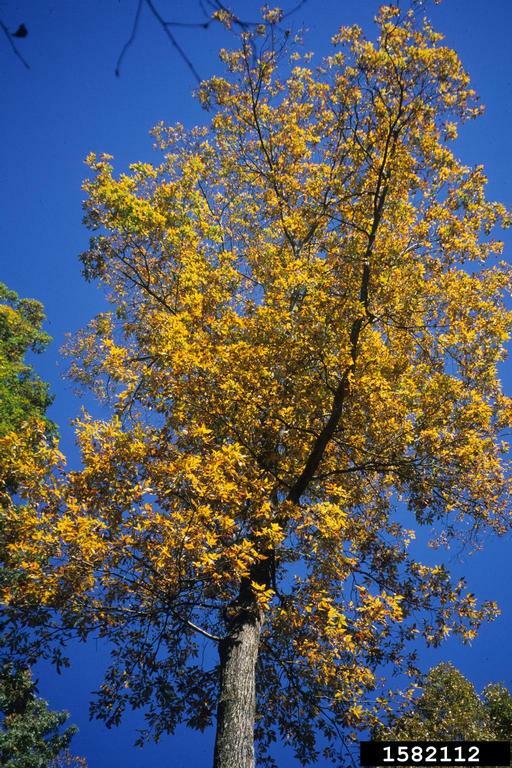 The Pignut Hickory is recommended for hardiness zones 4-8. Broadleaf Mistletoe - Phoradendron spp. Broadleaf Mistletoe (Phoradendron spp.) is an evergreen plant that is parasitic in nature, it grows freely on a variety of large landscape trees. Some deciduous host trees of broadleaf mistletoe include Apple, Ash, Birch, Boxelder, Cottonwood, Locust, Maple, Oaks Walnut and Zelkova to name a few. Conifers are not found to often be host of the Broadleaf variety, but can host the dwarf varieties. Mistletoe plants often develop in rounded form and can reach upwards of two feet in diameter. The plants develop small whitish colored berries that are sticky to the touch. Mistletoe plants are leafy and evergreen becoming most visible in the winter when the deciduous host trees have dropped their leaves. The plants are either female (berry producers) or male (pollen producing only). Many birds feed on the berries and excrete the living seeds which stick to any branch they land on. Older and large trees are often the first to be infested because birds prefer to perch on higher limbs. The down side of this is a heavy build up of mistletoe is most likely to occur in these same larger trees as the birds enjoy feeding on the berries of the mature Mistletoe plants. Often times growths in the upper branches will drop seeds to the lower sections below, spreading the growth even more. Dwarf Mistletoe does not spread in the same way as Broadleaf, instead it's seeds are forcibly discharged from the fruit, dispersing up to 40 feet away. Once a seed is in place the seed will germinate, during this time it will begin to grow through the bark of the tree and into the tree's water conducting tissues. Within the tissues, structures similar to roots form, they are called haustoria. Haustoria will spread as the parasitic bush grows and spread. Young growths are slow growing and may take years before they bloom for the first time, their succulent stems become woody over time at the base of each growth. Even if an entire visible growth is removed from it's host plant, it will often resprout directly from the haustoria that is embedded into the host. On the other hand dwarf mistletoe is not woody when mature and is segmented with small scale-like leaves. Mistletoe can be harmful to a tree that is already weakened but generally does not harm normal, healthy trees. It is possible for individual limbs and branches from healthy trees to become weak or die back. In instances of heavy infestation the entire tree may be stunted, weakened or killed if there are other factors such as disease or drought. The most effective way to control mistletoe is to remove the infested branches, this will eliminate the haustoria which will prevent re-sprouting. Infested branches must be cut at least 1-2 feet from the base of attachment to be sure you are removing all of the haustoria from the inner tissues of the host. In cases of heavy infestation it may be recommended to remove the entire tree as you can not safely remove more then a portion of the trees crown without causing severe damage or death to the tree itself. If you are not able to prune the tree to eliminate the growth, completely removing the visible mistletoe growth annually will often help limit the spread as only mature growths can produce seeds. Catawba Rosebay - Rhododendron catawbiense is distinguished by it's large pink flowers and evergreen leaves with bases that are rounded. It is an evergreen shrub or small tree that reaches heights of only 9-22 feet tall. It grows in a shrubby fashion, often branches closest to the ground. It is native to Mountain slopes, ridges, balds from 500-2000 rarely at lower altitudes. Found from Virginia and West Virginia south to North Georgia, west to Kentucky and northeast Alabama. The bark of the Catawba Rosebay is smooth when young, becoming furrowed and shredding with age. The leaves are alternate, simple, narrowly broad and elliptic. In extreme cold or drought the leaves often curl under. The upper leaf surface is a dark lustrous green in color, while the lower surface is a paler green. The flowers are considered to to be a corrolla Pink in color and are in a broad bell shape that can reach up to 6 cm in diameter. The petals and sepals number 5 each with 10 stamens, flowers occur in early Summer annually. The fruit is a linear or oblong capsule that is covered with red-brown hairs, the fruit occurs on erect stalks and mature between late Summer and early Fall. The West Indian Almond - Terminalia catappa, is a deciduous tree that reaches heights of around 75 feet. It grows in an erect form, generally with a single straight trunk sometimes becoming wider at the base with age. It is easily identified in the Fall because of the large whorled leaves that become a bright crimson color in the fall. Originally introduced from he West Indies but is cultivated and has become naturalized in hammocks and coastal areas of South Florida and the Florida Keys. It is similar to Wild Almond (Terminalia arjuna), which is also naturalized in Southern Florida but the leaves are more or less oblong or oval rather then distinctively obvate. The West Indian Almond has branches borne in whorls that are often drooping. The bark is smooth and a steely gray when young, becoming scaled with age. 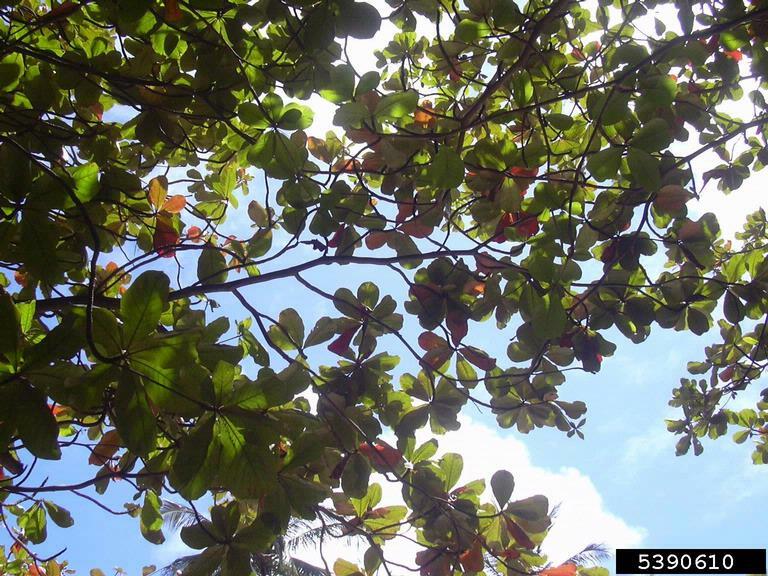 The leaves are alternate, crowded near branch tips in an almost umbrella like form. The leaves are simple, leathery in texture, narrowing to a short point with margins along the entire leaf. The upper leaf surface is dark green in color with obvious veining, becoming crimson in the fall. The flowers are bisexual and unisexual, borne in an elongated spike from the leaf axis, occurring in the early summer each year. Flowers are absent of petals, having 5 sepals and are green-white in color. The fruit is a flattened, fleshy, almond shaped drupe, green when young becoming yellow and then finally red or blackish-green when ripe. The fruit reaches sizes of 5 cm long and matures between late Fall to early Winter. When visiting a Christmas tree farm, nursery or even the pop up/fenced side of the road lot (you know the one, it has the giant blow up snowman/santa waiting to greet you) one can often be overwhelmed by the selection of Christmas trees available for purchase. There are dozens of options when choosing a tree, we have compiled a list of the top ten trees and a little about each one to help make your choice a little easier. The top five trees are very close in sales numbers based on my research, their position on the list varies based on each particular region. Fraser Fir (Abies fraseri), is the most popular Christmas tree sold in the United States: it has deep green colored short and flat needles. The aroma is considered by many to be strong and very long lasting. Fraser fir is a uniformly pyramidal shaped tree which reaches a maximum height of about 80 feet and a diameter of 1-1.5 feet. The strong branches are turned slightly upward which gives the tree a compact appearance and makes for good ornament support. Needled retention is very good on this variety. Fraser Fir has been used less for timber then other Fir varieties, because the difficult terrain on which it grows makes it tought to harvest. The wood is soft and brittle and may be used for pulpwood, light frame construction, interior knotty paneling, and crates. Fun Fact: Fraser fir boughs have often been used for "pine pillows" and bed stuffing. This is a very interesting way of introducing the scent of fir to your home. Balsam Fir (Abies balsamea), is a close second to the Fraser as they are very similar to one another. Balsam grows in an upright pyramidal form. The needles are flat and long lasting. On lower branches needles occur in two rows along sides of the branch, 3/4 - 1 1/2 inches long, spreading in form and not crowded. On older branches, the needles tend to be shorter and curved upward covering the upper sides of the twigs. Fun Fact: The Balsam was named for the resin (also called balsam) that is found on the bark ridges and wounds, this resin was used during the civil war to treat wounds. Douglas Fir (Pseudotsuga menziesii), is also very close in numbers sold to the Balsam and Fraser. It is very fragrant with good needle retention. The needles are dark green to blue in color and range from 1 to 1 1/2 inches long. Needles are soft to the touch and radiate out in all directions from the branch. They have a sweet fragrance when crushed. Fun Fact: The Douglas Fir is not a true Fir (not related), it has it's very own classification (Pseudotsuga). Colorado Blue Spruce (Picea pungens Engelm. ), is fourth in the top ten best sellers. It has dark green to powdery blue 1-3 inch long needles. It is well known to be the best for needle retention. The Colorado Blue Spruce is often sold balled and burlaped as a "live" tree to be planted after the holiday and enjoyed for many years to come. When young it grows in a nice pyramidal form, often spreading in form with age. Fun Fact: The Colorado Blue Spruce is the state tree of both Colorado and Utah. Scotch (Scots) Pine (Pinus sylvestris), is the most popular Christmas tree in the Pine family and the only to make the top ten. The dark green needles are 1-3 inches long and are retained on the tree even when completely dry. The scent is not as strong as some of the Firs but is very long lasting. Fun Fact: The Scotch (Scots) Pine is currently the most commercially planted Christmas Tree in the United States. Eastern Red Cedar (Juniperus virginiana), is a favorite in the Southern portion of the United States. It has dark green, shiny needles that are prickly to the touch. The branches are compact and form a pyramidal crown, except in older trees where the shape is more broadened. The leaves are usually arranged in opposing pairs along the branchlets. It is a very popular choice on most "cut your own" farms. The Eastern Red Cedar is a very aromatic option. Fun Fact: The Eastern Red Cedar is not a true cedar, it is actually a member of the Juniper (Juniperus) family. White Spruce (Picea glauca (Moench) Voss), is a regional favorite in the North Eastern United States and Canada. It has one of the best "wild" shapes on "cut your own" farms. The needles are a bluish-green in color and are poorly retained by the tree once it is cut. When crushed the needles have a unpleasant odor. The thick limbs hold ornaments (even heavy ones) very well. White Pine (Pinus strobus), must be mechanically trimmed to make into the pyramidal shape desired for most Christmas trees. It is most poular in the Mid-Atlantic United States (where it is commonly/naturally grown). The weaker limbs do not hold ornaments very well. This variety is very popular with allergy sufferers who can not handle the stronge aromas of most Christmas trees. Needles are soft, flexible, bluish-green to silver green in color and are regularly arranged in bundles of five. Needles are 2 1/2-5 inches long and are usually shed at the end of the second growing season. The White Pine has great needle retention with little to no noticable fragrance. White Pine lumber is has always been very valuable. The soft, light colored wood warps and checks less than many other species. The wood is used to craft cabinets, interior trims, and for carving. Fun Fact: Early Native Americans used the inner bark as a food source, later colonists used the inner bark as an ingredient in cough remedies. White Fir (Abies concolor), is sometimes mistaken for a Pine as it has the longest needles of all Fir trees. The narrow needles are around 1 - 1 ½ in. in length and occur in rows. They have good foliage color, good needle retention, and a pleasing shape and aroma. White fir has one of the largest ranges of any of the Western Firs. It can be found from the Rocky Mountains in Colorado and New Mexico to the Coast Range in California and Oregon. Fun Fact: The lumber from the White Fir is used for decking, pulp production, plywood, framing, crating, beams, posts and mobile home construction. Virginia Pine (Pinus virginiana), is the newest list maker and has not been used as a Christmas tree for nearly as long as the others. It is an alternate to the Scotch Pine in the South and has become the most affordable Christmas tree variety in that same region. The needles are a dark green to gray and are supported by stout branches, these branches hold even heavy ornaments very well. They are fast growers and can be harvested as Christmas trees in as little as 3-5 years. Thought they have many benefits that make them popular on downside is they must be mechanically shaped to have a pyramidal form. 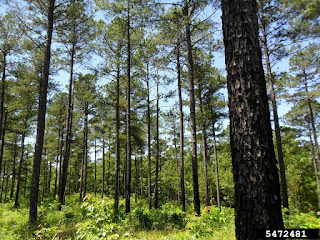 Fun Fact: The Virginia Pine is a rapid grower, often times even considered to be somewhat invasive growing in some not very favorable locations. This rapid growth and hardiness gives it an edge when planted on sites that have been recently clear cut or even mined. Winged Sumac - Rhus copallinum is a sumac that is most easily recognized by it's alternate, pinnately compound leaves with 4+ mm winged rachis. It is a small deciduous shrub or small slender tree that reaches heights of only 30-35 feet tall. Generally growing in an erect uproght fashion it can have single or mulitple trunks and is often thicket forming from the production of numerous root suckers. It is native to the North America and can be found growing throughout the Eastern seaboard from Canada and Maine in the North south throughout Florida, west through eastern Nebraska and eastern Texas. It is similar in appearance to the Prarie Sumac with the only difference being the rachis size. The bark of the Winged Sumac is smooth, brown or reddish brown with numerous visable lenticles. The leaves are alternate, pinnately compound with blades ranging in size from 10-30 cm long, having conspicuous winged rachis, the wings each reaching sizes of over 4 mm each, with 9-23 leaflets. The flowers are unisexual, with male or female typically occuring on separate trees, green-white in color, with 5 petals and sepals each abut 1 mm long. The fruit is a hairy rounded red drupe 4-5 mm in diameters, occuring in late Summer to early Fall and remaining until Winter. The Deciduous Holly (Ilex decidua) or Possumhaw Holly as it is more commonly known is a deciduous Holly tree that reaches heights of only 30 feet tall and grows in an ascending, erect or leaning fashion with a single or multiple trunks. In open grown specimens the crowns are cylindrical in form and densely foliaged, while in forest grown specimens branches are few. The Possumhaw is native to the Eastern United States from Maryland in the north to Southern Florida in the South, West through Kansas and central Texas. Most often located between 0-360 m in moist and wet woodlands, floodplains, bottoms, and occasionally dry uplands. It is similar in appearance to the Carolina Holly but can be distinguished by elliptic rather then oblanceolate leaves. The leaves of the Possumhaw Holly are alternate most often occurring in closely set clusters on short shoots which leads them to appear to be whorled or opposite, they are distinctly widest towards the tip with a long tapering base. The upper leaf surfaces are dark green, margins are not visible, edges are bluntly toothed, each tooth tipped with a tiny gland. The twigs are greenish in color when young, becoming greenish brown and then gray at maturity. 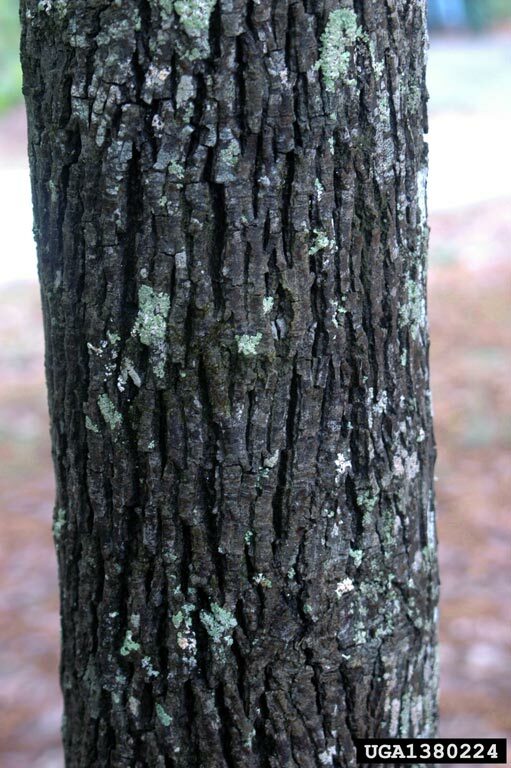 The bark is grayish or gray-brown in color, smooth when young becoming slightly rougher with age. The flowers are greenish white in color with 4-6 petals each, occurring in the Spring each year. The fruit is a round multi-stone drupe ranging in size from 4-9mm in diameter, varying in color from red to yellow or orange, occurring in the Fall and persisting into Winter. Image Citation: University of Georgia, Bugwood. 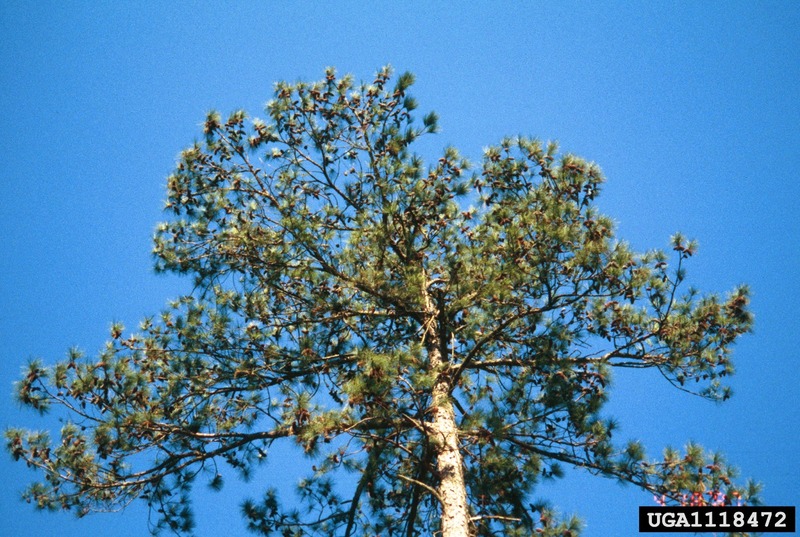 The Loblolly Pine - Pinus taeda - is a large evergreen tree that can reach heights of 80-100 feet in height. It is commonly found growing in the Western United States and Canada but is native to the Southeastern United States from Central Florida on North. It grows in a straight tall fashion with a short spread crown. It is most commonly found from floodplains and roadsides to well drained hillsides. Its trunk diameter can reach a very large 6+ feet and it is considered to be a very important timber tree. The lumber is used for construction, interior finishing, craft wood, paper/pulp production, railroad ties and pilings. 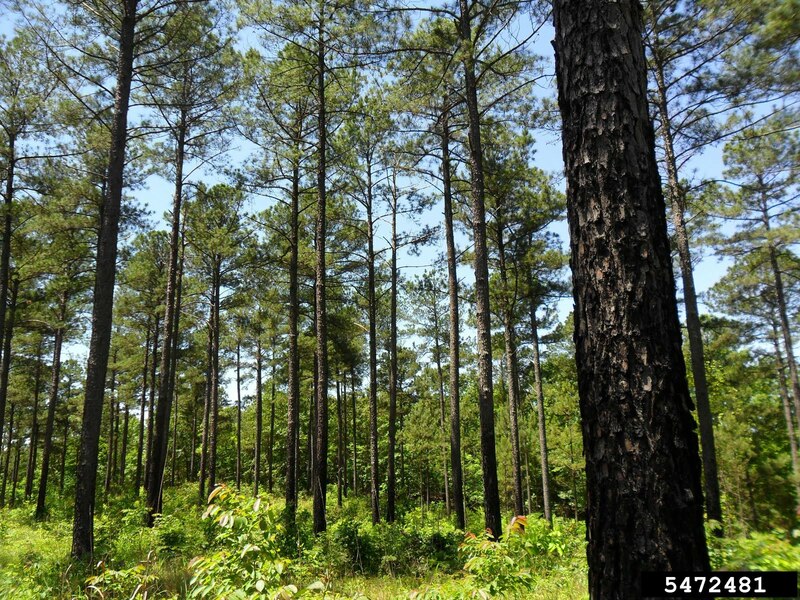 The name Loblolly comes from the southern term for the moist hollows or depressions that this particular tree is partial to. The needles are stiff and sharp tipped, pale green in in clusters of three. The needles are generally six to nine inches long and yellow-green in color and grow in an almost tufted appearance near the edges of the branches. The bark is cinnamon colored and appears in scaly plates. The cones are three-six inches long, reddish brown in color and egg shaped. The seeds are about 1 inch in size, black-brown in color and rhomboidal winged. The flowers are monoecious and yellow in color, they appear between May-June depending on the region.